Home / Acting Man / Toward Freedom: Will The UK Write History? Toward Freedom: Will The UK Write History? 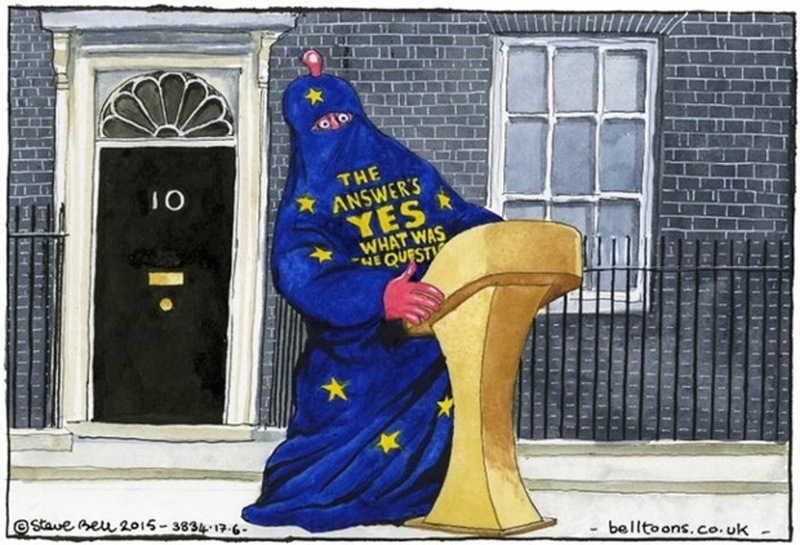 Mutating Promises We are less than one week away from the EU referendum, the moment when the British people will be called upon to make a historic decision – will they vote to “Brexit” or to “Bremain”? Both camps have been going at each other with fierce campaigns to tilt the vote in their direction, but according to the latest polls, with the “Leave” camp’s latest surge still within the margin of error, the outcome is too close to call. 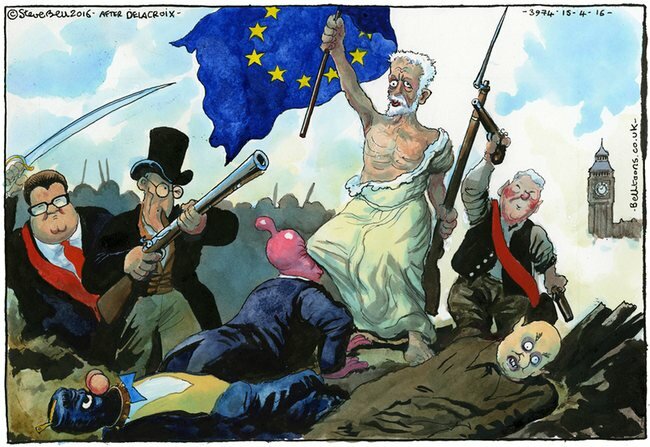 The battle lines are drawn…. It is a rare moment in history. The British haven’t had their say since they voted to join the European Community back in 1975. What was initially thought of as a project to unite Europe into one common market, with the benefits of free trade and great promises of increasing national wealth, has mutated into a completely different entity. The British have, instead, found themselves being dragged into a regional economy of zero growth, a weak currency and heavily indebted states. You may have come across the arguments of both camps, but here we wish to address what a “Brexit” or “Bremain” scenario would mean for Britain. If the UK Bremains… If the British vote to “Bremain”, Britain will start to operate with a “special status” within the union, after Prime Minister David Cameron reportedly renegotiated Britain’s relationship with the EU, in anticipation of the referendum. We are less than one week away from the EU referendum, the moment when the British people will be called upon to make a historic decision – will they vote to “Brexit” or to “Bremain”? Both camps have been going at each other with fierce campaigns to tilt the vote in their direction, but according to the latest polls, with the “Leave” camp’s latest surge still within the margin of error, the outcome is too close to call. The battle lines are drawn…. It is a rare moment in history. The British haven’t had their say since they voted to join the European Community back in 1975. What was initially thought of as a project to unite Europe into one common market, with the benefits of free trade and great promises of increasing national wealth, has mutated into a completely different entity. The British have, instead, found themselves being dragged into a regional economy of zero growth, a weak currency and heavily indebted states. You may have come across the arguments of both camps, but here we wish to address what a “Brexit” or “Bremain” scenario would mean for Britain. If the British vote to “Bremain”, Britain will start to operate with a “special status” within the union, after Prime Minister David Cameron reportedly renegotiated Britain’s relationship with the EU, in anticipation of the referendum. Cameron tried to change some of the rules of the agreement, to address the concerns of the British public that made them favor a Brexit in the first place. The matter of ‘sovereignty’ came first in the list of the most common anti-EU grievances, as the public felt the country no longer had a say in its own affairs, and was pressured to comply with EU regulations as part of the greater union. Cameron succeeded in having the UK released from any commitment to be politically integrated into the EU body, and there were talks about granting some autonomy and power to national parliaments, through the “red card mechanism” (i.e. if 55% of national parliaments object to one vote, they can block a proposal submitted by the European Commission). This proposal, however, does not in any way alter the UK-EU relationship, while it is also unlikely to be practically enforced, much like the preexisting “yellow” card that has only been used twice so far. Thus, British autonomy, specifically, remains unaddressed. When it comes to economic self-governance, Cameron got an explicit recognition that the Euro is not the single currency of the EU, and that the UK will not be pressured to contribute to euro zone bailouts. But what about the British economy itself? British businesses have long complained about losing competitiveness. In general, the EU single market makes it easier to move money and products and grants businesses a large consumer base. However, the data released by the Office for National Statistics cast a different light on this point: Europe has become a less important trading partner. In 2000, the EU represented 60% of the UK’s total exports. As of April 2016, this number has dropped to 48%. Meanwhile, imports from the EU have been within the range of 47% to 55% since end-2014, and are thereby contributing to a growing trade deficit. According to the chief executive of the “Vote Leave” campaign, Matthew Elliott, the drop in UK exports to Europe is linked to the poor economic conditions in the euro zone, thus reducing demand from Europe, while demand from non-EU partners has grown. Therefore, a Brexit will allow British businesses to speak for themselves, as opposed to speaking as one of 28 countries. The chart below reflects the increase in trade balance of non-EU trade partners, compared to the EU, particularly since 2012. 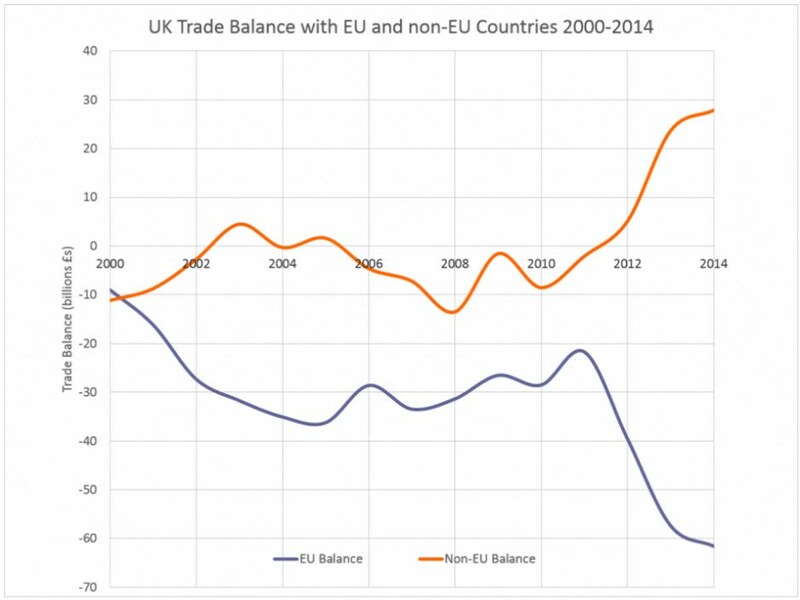 UK trade balance: EU and non-EU – click to enlarge. It is no coincidence that 1997 was the same year the Labor Party (founded by the Fabian society) came to power. Andrew Neather, former advisor to PM Tony Blair, revealed that the true nature behind the open border mass-immigration policy of the Labor Party was politically motivated to help construct a “truly multicultural country”. As per Neather, the ministers hesitated to reveal their plans publicly, which could risk alienating the Party’s “core working class vote”. Therefore, to promote their open-borders agenda, they focused on arguments based on tentative projections of potential economic benefits. United Kingdom: Long-Term International Migration, 2006 to 2015 Source: Office for National Statistics, UK – click to enlarge. Although Cameron managed to limit some of the benefits awarded to migrant workers, he failed to strike a deal that would make the biggest difference: imposing immigration quotas. In fact, Cameron’s approach made things worse: failing to restrict immigration while simultaneously cutting back on public spending, is a recipe for disaster; it will only increase the risk of the immigration crisis devolving into tensions and violence. What is really at stake here? 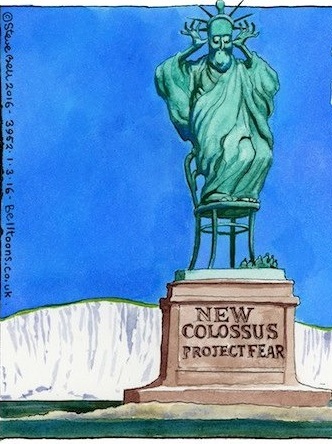 Immigration has indeed grown into a crisis and the British were forced to deal with the new realities that come with it. Not only did it affect the job market, but it has also affected British culture, even language. Already back in 2009, English was not the first language of more than half a million students in Britain’s primary schools. In Britain and beyond, the wave of mass immigration is often presented as a great leap forward, bringing us closer to multicultural societies, a concept that has long been promoted as the ideal. However, beneath the surface, this heavily marketed idea of “multiculturalism” or “cultural Marxism”, to describe it more accurately, has very little to do with diversity and positive cultural exchanges, as advertised. In essence, it allows governments to intervene extensively in society, under the pretext of acting as a protector of the minorities who grow increasingly dependent on the state. The social division, tensions and discords that would inevitably ensue, would provide fertile ground for further restrictions on personal liberties and self-determination. The Brexit camp argues that Britain has lost its sovereignty and autonomous decision-making, and paid a high price, both economic and political, to be part of the union. The immigration crisis and the inability to react to it, is merely another manifestation of this excessive centralization. After Brexit, though, Britain would no longer answer to a higher entity, nor be constrained by it. It would enjoy more self-determination and be able to directly address the interests of the British public. That does not mean that there will be less trade or that Britain will close its borders in the name of protectionism. Let us not forget, the UK is the second largest economy in the EU, so a Brexit will be a severe blow to the EU. With this leveraging power in mind, an independent UK can simply renegotiate its trade agreements, and most likely achieve a better deal overall, as well. Brexit, despite the “doom and gloom” predictions and dire warnings of the Bremain camp, will just allow the country to freely make whichever decision is right for its citizens at any given moment in time. The UK Referendum is indeed of great significance, but there is another country that has already gone through with an EU exit of their own, yet no one seems to remember: Greenland, an autonomous Danish territory, which voted in a referendum in 1982 to leave the EEC (European Economic Community), the EU predecessor. Greenlandic fishermen wanted an end to externally imposed restrictions on how much fish they could take out of their own waters and the outcome of the referendum achieved exactly that; and more: Greenland was given tariff-free access to the Community market for fisheries products, in return for allowing them continued access to Greenlandic waters, while it also got EU funding, on top of the money it received and continues to receive from Denmark. It did take Greenland three years to successfully negotiate this exit, but it happened. Every freedom loving person on the planet has their eyes fixed on this referendum. A clear majority voting for Brexit and therefore for more decentralization, would show that the British realized they can break free from their self-imposed nonage, and reclaim individual liberty. It would be nothing short of an act of courage to challenge the status quo and a chance for the British to speak their own mind. Writing from a little town in Switzerland, I wish the British public a smooth transition to a sovereign United Kingdom, for the sake of freedom, self-determination and peace.